Originally published in Creation 4, no 1 (March 1981): 6-10. Unknown to most people, the Australian Aborigines have many traditions surprisingly similar to parts of the book of Genesis, especially those regarding Creation and Noah’s Flood. 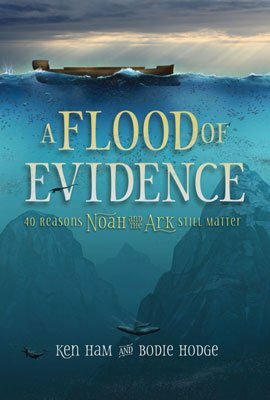 A Flood of Evidence, the book created to address the countless questions asked about the Flood and Noah’s Ark over the years! It contains what you need to know in a way that is easy to read. Bring the Bible to life with 4 free Sunday school lessons about Noah and the Flood from Answers Bible Curriculum! Introduction: In fact, Flood stories which include the saving of only a few people and animals, are found in many cultures worldwide and provide fascinating circumstantial evidence that the common ancestor of Aborigines, Jews, and indeed all modern races of man was Noah. The Genesis account, however, is the most detailed and systematic of them all. To refresh your memory, here is a brief summary of the major events associated with Noah’s Flood, as found in Genesis 6–9. Men had become exceedingly evil and violent. God warned Noah He would send a flood as judgement upon this terrible evil. God instructed Noah to build a boat for his family and forthe animalsthat Hewould send to the boat. The waters of the flood covered the whole earth, including the mountains. All men and animals not on the boat were destroyed. Noah first sent out a raven, and then a dove, to find out whether the land was dry. God sent the rainbow as a sign that He would never again destroy the earth by a flood. The points of interest in the 3 following Aboriginal traditions are in bold type and any similarity to the Genesis story is indicated in the margin. Differences in the flood traditions are also relevant. The Genesis record talks of there being only one race of man from the time of the flood until the towerof Babel. At the tower of Babel, God dispersed the people over the surface of the world by giving them different languages. It is therefore to be expected that the stories of the flood would contain not only profound similarities but also differences. These differences would be due to both the confusion of tongues and the varying relationships to the true God which cultures had. In ancient times the sea made the watermarks on the mountains and ranges. For example Mt. House, Mt. Waterloo, Mt. Hann all have these watermarks, they are right on top. The reason for this flood was men killed the old woman’s third son, the one she loved. This old lady went down and speared the “eye” of the sea. It is said that she was staying on Nowulu Island. The son was dear to her. They told her “They have killed him; already they have taken his life,” they told her. “Ah,” she said. She wept once and did not weep again. “I’ll finish them” she said. She went over to a place called Garajin and there she speared and poked the small “hole” in the sea. The sea went back and back exceedingly, it sucked it right out. The place was left hard and dry and the fish were flapping about on the hard (bottom) place for there was no water. At that time the mountains were made. We say, the present tides don’t rise like this. For this sea travelled across like a range to them. The mountains sank beneath it. Then she finished them. They were drowned. While still there was no water, that is at the time when it disappeared, she picked up turtle and fish and took them up to the top of the hill at Nowulu The place is called Nowulu, it’s an island, that the place she climbed up to. Here she remained and dug for water right on the top Then that one—the sea—was travelling and all the mainland was underneath it. That was the time it went back. That time it finished them; it drowned all those men. Only those who climbed right on top, over there, only those may be living. Then they returned this way. that was the sea that drowned all the men of that generation on the earth. Then (that time) they made themselves into turtle and fish and now those of that generation are living creatures in the sea. They were people first but they made themselves sea-creatures. The sea drowned them all. The Flood was a judgement upon evil. It was sent to destroy all men. The Flood covered the mountains. All the land was covered. Only a few were spared. All other men were drowned. Long, long ago there was a great flood. It originated from the fact of some children who found the “winking” owl in a tree and plucked out all its feathers. They forced a grass reed through its nose and treated the bird most shamefully. The bird flew without wings, into the heavens and showed himself to Ngowungu, the Great Father. Ngowungu became very angry and decided to drown the people. Later the people saw a small cloud rising which grew bigger and bigger till it spread all over the sky. The thunder began to roll and crash and the people were greatly afraid. With the rain and thunder was a terrible wind which broke great limbs off trees and rooted up others. During this terrible storm there was a noise above the awful crashes of thunder. This noise was coming from the north. The salt water, the sea, came pouring over the ranges from the north. The flood rose higher and higher till all the land was covered except the tops of two or three mountains. A bird with a leaf in its mouth flew in front of them showing them the way to Mt. Broome. From further west a man and his wives with a dog were battling their way in a canoe when a bird with a leaf in its mouth flew in front of them showing them the way to Mt. Broome. They eventually reached Mt. Broome and landed there where some other survivors were. The flood was sent to judge wickedness. God sent the flood to drown all the people. All the land was covered. A man and his wife in a boat with an animal. A bird with a leaf in its mouth was the sign of dry land. They landed on a mountain. All other people drowned. There was a sacrifice of blood at the end of the flood. Long ago, in the Creation country across the sea to the west, some people saw these red-legged birds strutting along with their heads moving up and down. Whenever the people approached them they moved forward always keeping the same distance between themselves and their followers. There were millions of these birds, and they were much taller than they are today. The men followed them to discover where they were all going. The birds walked east and eventually led the men to the coast of Australia. They stepped out of the sea where Fremantle is today, then turned north and walked up the coast. The men continued to follow them. When they reached the point just below where Port Hedland is now situated the great flood came. The sky opened and the water poured down in a great deluge. Many people were drowned, but some were saved on mangrove boats. They paddled towards the ranges in Central Australia, the Mardudjara people (now camped at Jigalong) leading the way. They were the first people to take dogs to the centre of the continent. At last they reached the MacDonnell Ranges, but then the receding waters turned to ice. By this time, another group of people had come into the north of Australia, so this southern group was trapped. At this stage, the “Wati Kutjara” the “itwo gods” came into action and began digging a way through the ranges, but this method proved too slow and the people would have perished before they could be freed. So, the Wati Kutjara blasted their way through, cleaving the ranges apart (as at Stanley Chasm) and so opened an escape route. The people surged forward with great relief and passed through the opening to salvation. However, they were faced with a great disappointment, for beyond the range there was only a great empty land. Some were saved on boats. The boats went to the mountains.